Before beginning any fitness program, always see a qualified healthcare provider for advice and to address any questions or concerns. The exercises presented on this website are for suggestion only and should not be substituted for medical diagnosis or treatment. Participate at your own risk and stop if you feel faint or experience shortness of breath. 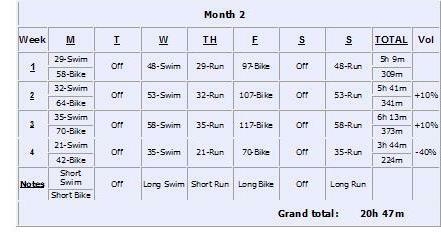 2-Swim, 2-Bike and 2-Run per week (6 sessions) You have between 4 and 8 hours per week to train. You will most likely train over the mileage necessary for the triathlon. This will ensure that you can do all three events together. This program is based on finishing times of 'back-of-packers' If you are new and somewhat slower, that is Ok. If you do the times, you will finish the mileage. Faster people with previous athletic backgrounds will do just as well or better on this program as you will be exceeding the distances which will make you better prepared for a good race. Start this program if you can do Week 1's minutes fairly consistently with no problems or extreme fatigue. If not and you need a running/biking program to start before this program, go top 'Couch to Olympic.' Re-organize the program around to suit your schedule. JUST REMEMBER to keep the short sessions and Off days around the Long sessions. This will allow plenty of rest before and after the long sessions. You don't have to do 'two-a-days' if your schedule doesn't permit. 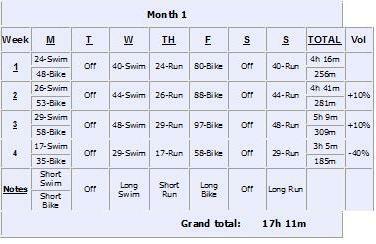 Just reorganize this and train on 6 days instead of 5. Although you will have to do two-a-days if doing the 3x program. You will have better success if your two-a-days are split up in the morning and night sessions. ALWAYS leave minimum 1-2 days of NO TRAINING each week. Your body will thank you and will prevent injuries. This program IS JUST a volume-builder. If your new to endurance, its recommended to focus on only volume for your first year, the following years you can start adding intensity-specific workouts as you will have a good base. BUT the following program is easily modified for intensity training. Program training details and information following this schedule. Each Discipline has a short and long session per week. The Short session will be 60% of the long session. Week 4 of Month 1, 2 and 3 is a 40% reduction in duration to facilitate rest and healing. You only increase your duration on week 2 and 3 by 10% a week. A golden rule. Get fitted for a proper running shoe at a dedicated running store FIRST!!! A lot of injuries can be avoided this way...just ask us. Avoid running on asphalt or concrete....find a good, smooth trail. A good warm-up is imperative to a safe run. A recommendation is to start with a 5min walk, 3-5minute light, slow jog, 5min walk, LIGHT, gentle stetching, 5min walk THEN start your run. Doing this will get some blood flowing to your muscles before stretching. NEVER stretch a cold muscle. If you find that you start getting tired midway through your run, add some walking intervals BEFORE getting tired. Example: On your 30 minute long run, you get tired at the 15minute mark. Try this: warm-up, run 10min, walk 2min, run 10min, walk 2min, run 10min, cool down. Break your long runs up into 1/3rds or 1/2's with 2minute walking intervals before you get tired. Trying to push yourself through a tiring last part of your run is a recipe for injury. Cool-down. Very important. Cool-downs eliminates lactic acid, brings your heart-rate to normal and prevents muscle cramps. Walk for at least 5-10minutes. The more the better. Do a LIGHT, gentle stretch session after your walk, walk some more. Later that day/night, do a more intensive stretching. Heart-Rate Training - Is it for you? 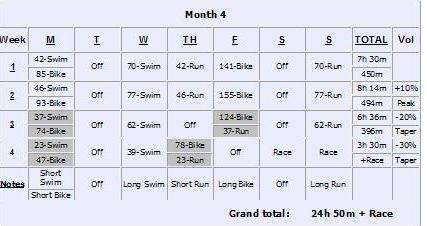 See the cells with the 'grey' background in the final 2 weeks of your training plan? These are 'brick' workouts. As your volume starts decreasing 2 weeks leading up to your race, you will want to mimic the swim-to-bike and the bike-to-run transition back-to-back. This is your race specific training. Bike-to-run will be the most difficult. These sessions should be done at your zone 1-2 pace or 2-3 modified RPE. We want these EASY. Also what helps others for the bike-to-run is to tack on about 5-10minutes of running at the end of your bike rides using the Karvonen zone 1 or zone 2-3 modified RPE...a light pace. If doing any speed work or training at a higher heart-rate zones, do them on the short sessions. Always keep your long sessions easy-going. You will note that the minutes are not rounded to zeros and fives like most other programs, example: 32, 34 NOT 30, 35. I do not round up or down as, in doing so, I would be violating my personal 10% week per session rule on many occasions. Plus its a more consistent program in my opinion. 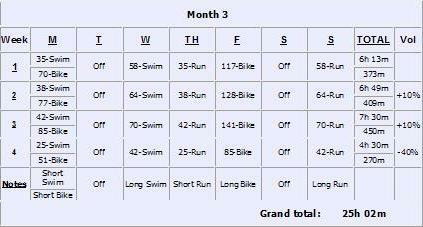 This plan is from www.beginnertriathlete.com Visit their site for more focused plans.